Height of fences could be the key issue. Security of facility's perimeter is reason it was built that way. Texas is 2-0 in Big 12 play after pair of wins over Iowa State. Ahead of the 2018 softball season, a new advertisement appeared by the outfield scoreboard at McCombs Field. The Taco Shack target promised free tacos — at least a coupon for one — should a Longhorn hit a home run off the large sign. Alas, McCombs Field patrons have gone home hungry most of the time. Thus far, only Bekah Alcozer’s 2018 shot against Oklahoma State has fed the fans. Now a senior outfielder, Alcozer has hit 14 homers in her college career. Her favorite? A grand slam against Missouri at the 2017 Mary Nutter Classic in California. Her tie to Texas’ taco trivia is also memorable. “I think it’s pretty cool, but it’d be nice to get some of my other teammates to hit it,” Alcozer said this week. That more softballs haven’t hit the Taco Shack target isn’t surprising. In general, home runs have not been plentiful at McCombs Field. Despite going deep twice in Saturday’s 6-1 beating of Iowa State, Texas (28-6) has hit only nine of this season’s 24 home runs at home. 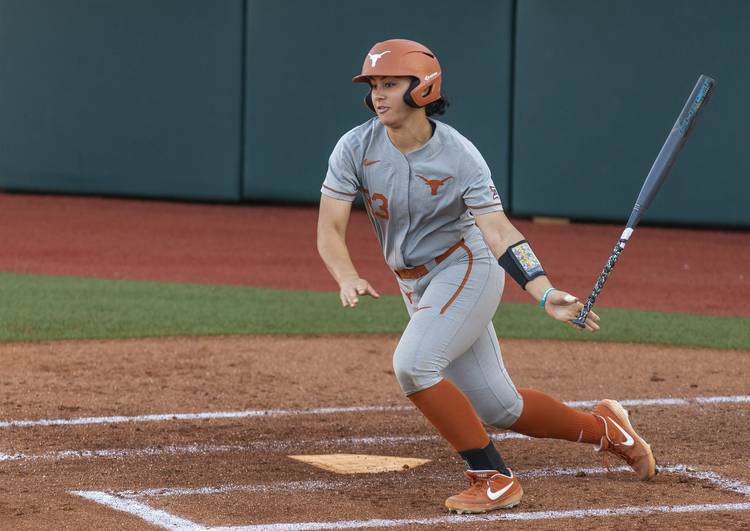 Over 20 games at McCombs Field, Texas and its opponents are averaging 0.65 homers per game. In a five-season span from 2014 to 2018, Texas averaged 0.41 home runs over its 138 appearances at McCombs Field. In 147 games at road or neutral locations, Texas went deep 147 times. On a per-game average during that same stretch, UT’s opponents clubbed 0.37 homers at McCombs Field and 0.85 outside of Austin. When it comes to home runs, Oklahoma has ranked among the NCAA’s top six teams in each of the previous two seasons. The Sooners, though, were held to one homer during a three-game series at McCombs Field in 2017. The next season, Oklahoma hit seven in the three games it played against UT in Norman. During its second varsity season, Texas christened McCombs Field with two wins over UT-Arlington on Feb. 7, 1998. Former UT administrator Lynn Wheeler, who oversaw the stadium’s construction, recalled that not many models existed for the “cutting-edge” fast-pitch park that Texas wanted. A facilities consultant from UCLA was brought in to help with logistics, but the decision was eventually made to build a softball-size version of Disch-Falk Field. With 200 feet to both foul poles and 220 feet to deep center field, the dimensions at McCombs Field aren’t unusual. Oklahoma’s Marita Hynes Field is the biggest stadium in the Big 12 with 225 feet needed to clear the fence in center field. McCombs Field’s dimensions match the in-state stadiums owned by Texas Tech, Texas A&M and Baylor. Marita Hynes Field, however, is witnessing 2.13 homers per game from the Sooners and their foes this season. Through Friday, Texas Tech’s Rocky Johnson Field and Texas A&M’s Davis Diamond were averaging 1.67 and 1.41 homers. Getterman Stadium in Waco was producing 0.71 homers per game. So why is it hard to hit homers at McCombs Field? Has Texas just recently lacked power in its lineup? 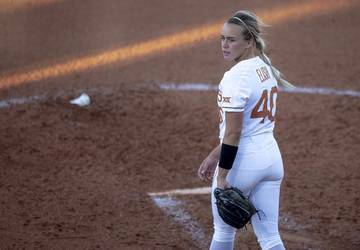 The only three-homer game in UT’s history was recorded by Tallie Thrasher at McCombs Field in 2010. Two seasons later, Taylor Hoagland hit half of her school-record 18 homers at home. But it’s not as if balls are flying off the bats of the Longhorns’ opponents these days. (This spring, UT has surrendered four home runs at home and 10 away from Austin.) Lindsey Stephens, whose 47 career home runs in 2013-16 rank second all-time at UT, hit 35 of her homers on the road. Alcozer said UT doesn’t change its offensive approach when playing at home. Averaging 6.4 runs per game in 2019, Texas is plating 6.6 Longhorns during each home game. (En route to a school-record 372 runs in 2012, UT averaged 6.2 per game.) Texas entered the weekend with a nation-leading 60 doubles, 34 of which had been hit at home. With Sunday’s matinee against Iowa State up next, UT has added three homers to its stat sheet this weekend. Alcozer and junior Kaitlyn Washington both homered Saturday. Pitcher Miranda Elish complemented Friday’s no-hitter with a grand slam. After its two wins over Iowa State, Texas is 2-0 in Big 12 play. Ranked 10th, Texas joined No. 2 Oklahoma, No. 14 Texas Tech and No. 21 Oklahoma State in this week’s NFCA poll.